2nd album from Swedish band. Here we got 14 tracks of superb retro-psychedelia, often compared with JEFFERSON AIRPLANE. 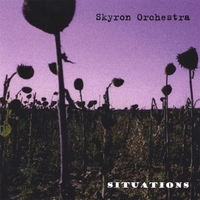 The influence is there, but SKYRON ORCHESTRA is far heavier with lots of nice fuzz guitars and farfisa organs. Singer Veronica is a ace as well !! All killers, no fillers, and if you enjoyed their debut album, you will adore this one !! Incl. Videos of "Sacred atmosphere" and "Free ride"